Hotel de Lencois is set in 4 hectares of gardens less than 500 metres from the centre of Lencois town, which prospered during the 19th century diamond mining boom. The town is now a tourism centre for Chapada Diamantina National Park. There are 3 categories of room, all en-suite, air conditioned and with a private balcony. Flatscreen TV, minifridge, phone and safe are standard features and the different rooms are chiefly distinguished by size, some sleeping up to 2, some up to 3 and others up to 4 people. You have a choice of local and international cuisine at the restaurant, and can enjoy time out in the bar as you chat to other guests. There is an inviting swimming pool with a sundeck, a, games room and children's playground as well as the pretty gardens. After a day in the national park a soak in the jacuzzi, time in the sauna or a massage are great ways to relax. Chapada Diamantina National Park is on your doorstep, offering ample scope for hiking and photography with its steep hills and canyons, deep valleys, waterfalls, natural pools and caves. The town of Lencois has cobbled streets, brightly painted houses, and a number of restaurants, and is just a short walk from the hotel. Open: Hotel de Lencois is open all year. Location: The hotel is a short walk, about 0.5kms, from the centre of Lencois town, which borders Chapada Diamantina National Park. Rooms: There are 3 categories of room: forest standard, upper forest and patio. All are air conditioned, have TV, minibar and en-suite bathroom. Forest standard sleep up to 2 people, upper forest up to 4 and patio up to 3. Forest and upper forest rooms have a balcony and hammock, with patio rooms also having a small courtyard and hammock. 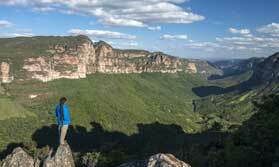 Activities: Go walking and trekking in Chapada Diamantina, famous for its stunning scenery. Explore Lencois, a former mining town, with its painted houses, cafes and restaurants. Relax by the pool, stroll in the gardens, enjoy a massage, sauna or soak in the heated jacuzzi. Facilities: The hotel has an outdoor swimming pool, jacuzzi, sundeck, sauna and massage area. It is set in 4 hectares of gardens and grounds. There is a restaurant (see below), bar and wine cellar, a reading room, games area, meeting room and children’s playground. There is a small museum on site, documenting the diamond mining history of the town and area. Dining: Roda Dagua Restaurant serves local and international dishes, complimented by your chosen wine. Children: Children of all ages are welcome. There is a playground. Some rooms sleep up to 3 and 4, suitable for families. Health: Lencois is a low to no risk malarial area. Communication: There is complimentary Wi-Fi internet access. Notes: One room has been adapted to be wheelchair accessible.